At a time when Kashmiri boys are grappling with uncertainty and insecurity, a Srinagar boy has been selected for the upcoming four-nation under-19 cricket tournament in India. Qamar Iqbal, a resident of Safa Kadal in downtown Srinagar, is a class XI student of Sri Pratap Higher Secondary School in Srinagar. 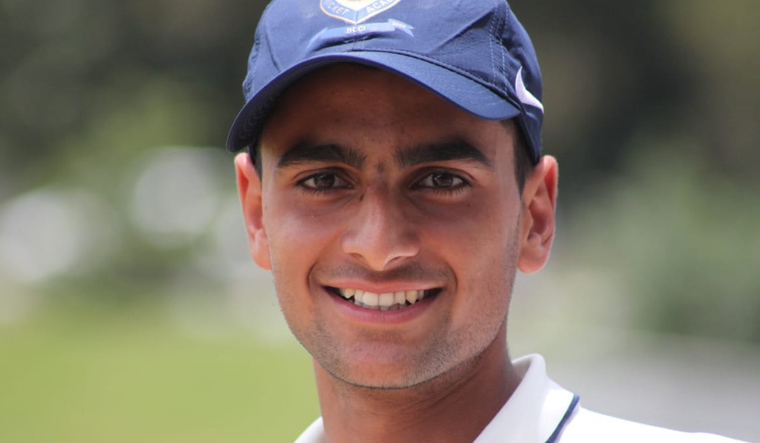 Iqbal, who plays for Kashmir Gymkhana Cricket Club, told THE WEEK that he was elated to hear the news of his selection. The only son of a doctor couple said his parents showed a lot of patience with him and supported him ever since he started playing cricket. Qamar was picked in view of his appreciable performance in U-16 and U-19 matches in and outside Jammu and Kashmir. The opening batsman has so far scored one century in U-16 and two in U-19 against Haryana and Himachal. He has notched up several fifties, too. Qamar's performance at state and zonal level has also played a part in his selection. The youngster admires the batting style of Kevin Pietersen. “I like the way he bats and besides he is tall like me,” Qamar said. Not many players have been able to make it to the national level largely due to the strike in Kashmir and poor infrastructure. Experts believe that Kashmir has good potential to produce quality cricketers if the state and the Centre assist the aspiring cricketers in the state. All-rounder Parvez Rasool—captain of the state cricket team—is the first player from Jammu and Kashmir to don the Indian jersey and also, play in the Indian Premier League.